Fab Five 4-H Club members and other volunteers are pictured with Liberty Park Veteran’s Memorial caretakers Rick Tipton and Sherry Hixson. 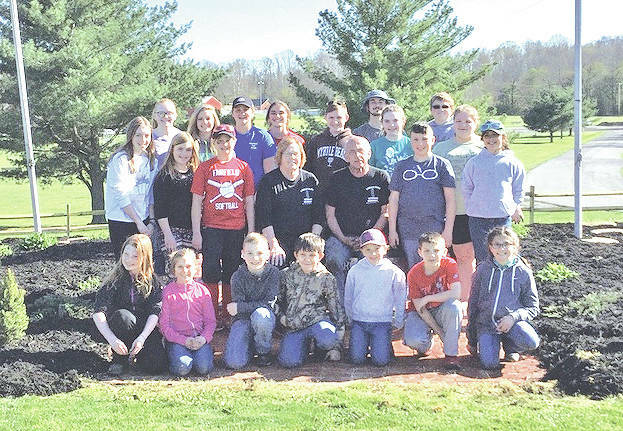 The Fab Five 4-H Club recently came together at Liberty Park to help the caretakers of the veteran’s memorial to keep the grounds looking at its best. There were 27 of 34 excited 4-H members who came to mulch the entire memorial. All the members were happy to be a part of a community service project that was bettering a memorial for those who protect the country’s freedoms by making the ultimate sacrifice. The caretakers, Rick Tipton and Sherry Hixson, were grateful and appreciative for the materials donated to the memorial. They would like to thank the following people: Fab Five 4-H Club, Lowe’s in Hillsboro, Jared Warner, Mark Lerch, Abbott’s Shirt Shack and Sheila O’Cull from the Home Depot in Lebanon. Aubrey McKenzie is the news reporter for the Fab Five 4-H Club. https://www.timesgazette.com/wp-content/uploads/sites/33/2018/06/web1_Clover-pic.jpgFab Five 4-H Club members and other volunteers are pictured with Liberty Park Veteran’s Memorial caretakers Rick Tipton and Sherry Hixson.